SUBCON Thailand is the only event that is organized and supported by the Thailand Board of Investment. The 2018 show is expecting to attract over 25,000 international industrial part-buyers from 15 countries, including major buyers from 1st and 2nd Tier manufacturers. BOI invites major industrial part-buyers to participate in the Business-Matching Program. The outstanding success of the previous event set a new record of more than 6,419 matching partnerships which resulted in over 10.2 billion Baht in business… and even more is expected in 2018. 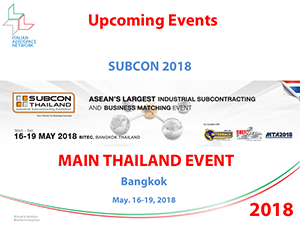 SUBCON Thailand is ideal event for part-makers in the Automotive, Construction, Mold and Die, Mechanical, Electrical and Electronics Industries. The show also offers a business platform for new industries such as Medical Devices and Aerospace. The 2018 show will feature quality industrial components and parts from Thailand, ASEAN and Japanese part-manufacturers in areas such as metals, fasteners, plastics, and rubber parts, along with other areas for possible sourcing of parts. IAN delegation will join this strategic event concerning Thailand market and the wider ASEN market, as already done on 2016 and 2017.